When you saw your child tearing up some paper left at your table, what was your initial reaction? If the paper is something important of course you'll get mad. I do, at the first time I saw Isobelle tearing up some little notes whenever, wherever she finds it within her reach. But she will not just leave the scatter behind, she'll lend it to me afterwards. And now, I didn't have to scold her for some reasons that paper tearing is really helping her with fine motor skills. I just need to be careful putting up important notes that she can reach. 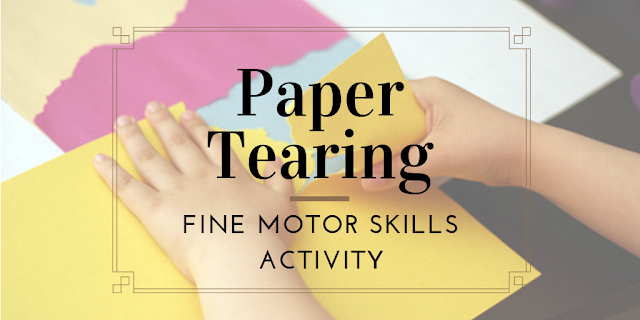 Paper Tearing helps develop fine motor skills and later on helps with pencil gripping. Isobelle was having difficulty before when it comes to gripping things, that she wasn't able to write efficiently, even holding a playdoh. That is why from time to time I let her play with playdoh and alternatively let her doodle. She can now open her own biscuit packs and able to open up pouches with zippers closure. The simple things she cannot do before. Able to hold her spoon and grab a plate. She was able to feed herself on her own. What can we do about it after the tearing activity? You can pair it with a pasting activity for your child to create a different artwork. Use the cut strips to create flowers, a rainbow or anything you wanted to. You can spend a merely 10-20 minutes on this activity. Believe it or not, it's a great activity to help develop the small muscles in the hands.